Last Sunday the first programme in the series 'The Wonders of the Solar System' presented by Dr Brian Cox, was aired on BBC2. Due to him being in a few bands before getting his PhD, Brian has often been referred to as the 'rockstar physicist'. Never mind that, it's his far-too-good-to-be-true cheekbones and thick mop of hair that fascinate me as he is older than he looks! His enthusiasm for his subject is infectious. I am hooked and really looking forward to the next four programmes. And here are some London images that loosely tie in with the programmes. Row 1: The Quays (previously The Half Moon), N7; Belgravia, SW1; Upper St, N1; St Lukes, EC1; St Pancras churchyard. 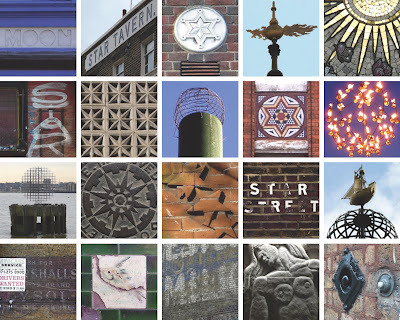 Row 3: Circumshpere, Deptford Wharf; coal hole cover; Crouch End Broadway; Paddington, W2; Cockspur St.
Row 4: (Mars) Marshalls, Dalston; (Neptune) closed fishmongers, W3; (Milky Way) Nestlé Milk, New Cross; (Venus) Lime St, EC3; (Saturn) doorbells SW1.